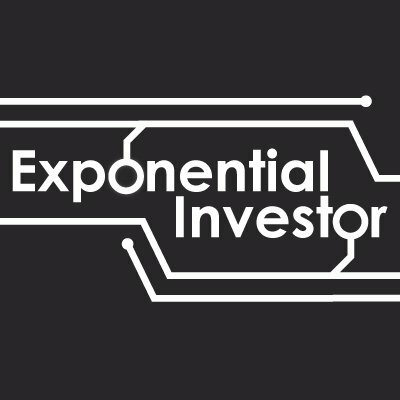 Exponential Investor’s recent interview with the CEO and Co-Founder of Premonition, Guy Kurlandski. Article written by, Andrew Lockley of Exponential Investor. Barristers are known for their high fees, and big egos. When they win, it’s because they were great. When they lose, it’s because their client’s case was a dead loss. As a client, you’re paying for this fallacy. But up till now, there’s been no way to be sure of why your case was lost. Were you in a hopeless legal funk – or was your lawyer an overpaid goon? Miami-based analytics firm Premonition AI has taken the legal sector by storm with a deceptively simple premise: apply machine learning and “big data” methodologies to court records. Moreover, the three-year-old company has been able to capitalise on its innovative concept. It raised a seed round at a $100 million valuation, which is a record for lawtech. 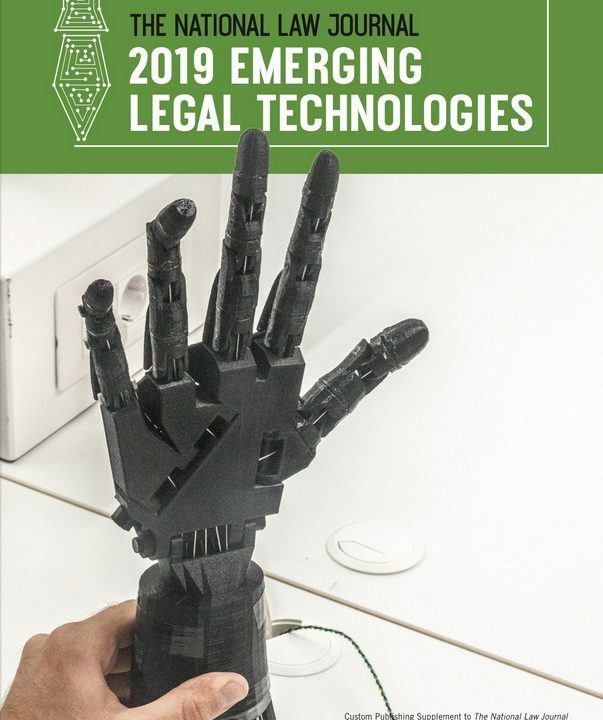 After this, Premonition built the world’s largest litigation database – and has also begun to apply its technology to related fields. In just over a month the company created an insurance loss database that was 30 times larger than the previous industry leader. I managed to get Premonition co-founder and CEO Guy Kurlandski to give me the juicy details. He told me all about the big data revolution; how his company has maintained its technological agility; and how the legal sector has responded to being disrupted by analytics. AL: Hello Guy. Can you start off by giving us your elevator pitch? GK: Premonition is the legal disruptor. We operate within a $437 billion USD legal industry. That’s what is spent on representation and legal services alone – not including settlements. Our system has the data and intelligence to know who wins, what they win, and how. It disrupts everything. We show you the exact lawyer you need to represent you, in front of a particular judge for a particular case type. It brings real transparency to an opaque and murky industry. Up till now, choices were made for all the wrong reasons. AL: What are the “wrong reasons” to choose an attorney? GK: We like to describe ourselves internally as being in the business of “perception-reality arbitrage”. Our analytics finds where conventional wisdom diverges from facts. We leverage that gap to our clients’ advantage. Before us, conventional wisdom was all you had to go on – and it didn’t work very well. In Miami there are 17,000 lawyers. How do you even begin to find the right one? People choose based on their perception of who’s top. That perception is as much a triumph of marketing as an indication of courtroom skills. AL: Doesn’t it come down to money? GK: Absolutely not. We found the top 20 best-performing US lawyers charged only $358/hr to win 80% of cases, whereas average “Big Law” attorneys charged $727/hr to win just 53%. We also find practices that present themselves as authorities in trendy niche specialties, like bitcoin. However, many such firms have never won a relevant case. Being able to ask our AI which lawyers have successfully litigated those cases puts an end to such posturing. 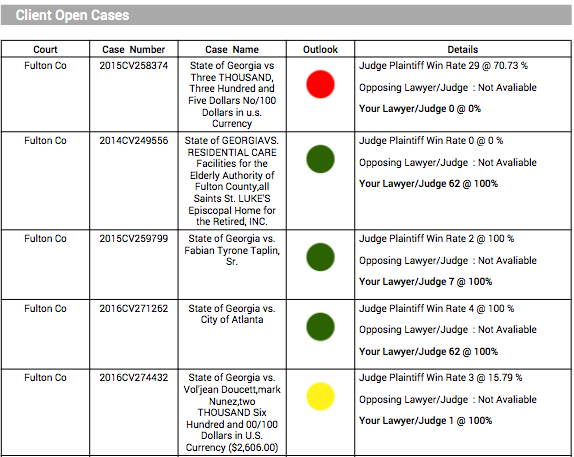 AL: Does “success” in court have more nuance than a spreadsheet reflects? GK: Automation should never be allowed to make decisions which require wisdom. That’s as true in choosing your representation as it is in evaluating a university student’s essay. There may well be attorneys who specialise in taking on very tough cases, who do not fare as well in our performance ratings as those who only accept slam-dunk winners. Premonition is a tool that allows clients to narrow the search; it doesn’t free them from due diligence. Factors like an attorney’s personality, or fee, will always remain important. AL: Don’t league tables dissuade professionals from taking difficult cases? GK: The standard counter is that the “good lawyers” are the ones that only take the “easy” cases. There are a number of reasons why this is incorrect. Firstly, the UK has a “cab rank” rule. A barrister has to take your case and can’t discriminate on the basis of risk. Secondly, our data shows specific detail of performance variability. We have an example on our site of a lawyer taking literally thousands of the same types of cases, with very similar facts and law, and getting results that range from 23% to 63%, where the only change in variable was the judge. 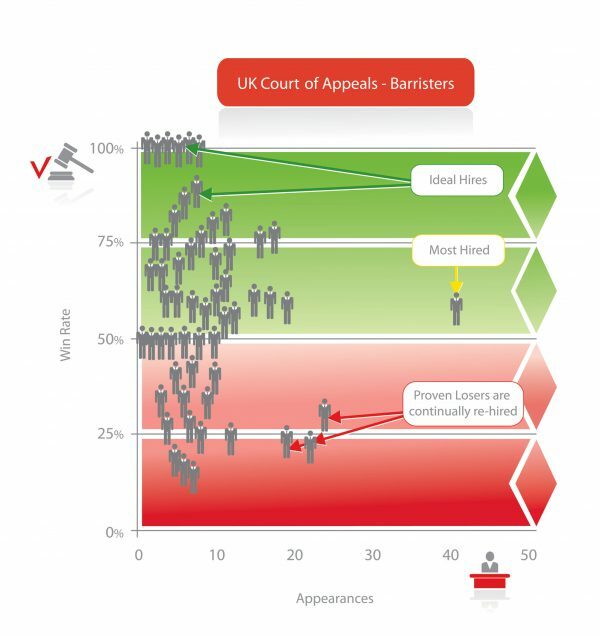 There was a 40% spread from one judge to another – showing that the lawyer was a good performer before some judges, but poor before others. Most lawyers are paid by the hour, with little direct incentive to win a case. Until Premonition, no one kept track of win rates – not even lawyers themselves. However, in non-UK jurisdictions some lawyers might cherry pick easy cases, when win rates are better known. Realistically, though, there will be drastically less work for lawyers outside the top 20 – so there will be little choice for many of these litigators than to take the case and do the best job they can with it. Since not everyone can be top 20, competition on factors like speed and price will come into play. The market will become transparent and efficient. AL: Are some lawyers so bad, that you’d be better off doing it yourself? GK: Self-representation only beats some lawyers appearing before some judges. The number varies widely. AK: How does Premonition obtain its information? GK: The court records in our database are publicly available. If you wanted to develop performance statistics like ours, you could have done it. It just would have cost you thousands of man-hours. We’ve automated the process of scraping and normalising these records from 3,124 US courts. We’ve become one of the largest web-scraping operations of any kind in the world, and the single largest user of virtual private networks (VPNs). We’re the only comprehensive litigation database that includes records from the state level, where 97% of cases take place. Our system can “read” over 50,000 records per second, so the nature of our queries is limited only by the information represented in the records. That can range from basic stuff, like how long on average a given lawyer takes to close cases. It can also handle more specialised queries, like how often a given motion will succeed before a certain judge, or how effective an expert witness is at swaying a case. AL: If this information is so disruptive to the status quo, why is Premonition the first to exploit it? GK: Applying popular analytics techniques to the legal sector is common sense. People have tried to build systems like ours. But, despite big budgets, they were generally unsuccessful at producing accurate, usable results. We were also told by those involved that marketing departments were disinclined to upset their principle client base of law firms. Being outside of the traditional legal ecosystem, we didn’t have to deal with those encumbrances. AL: How has the industry responded? GK: Clients have been asking for this kind of information for years, so uptake has been fast and furious. Many firms’ general counsels now require performance data from their law firms. Also insurers are seeking data on their risks, and many law firms are playing catch-up. When we released our initial public report on the UK’s High Courts, there was a lot of grumbling from firms that didn’t fare well in our rankings. However, there’s no turning back the clock on analytics once they enter a market. Unsurprisingly, the best firms realised that winning clients is simple – when you can prove you are better than their existing lawyers. Now, displaced firms are reluctantly joining the performance bandwagon, rather than risking falling further behind. Today, 19 of the 25 largest global firms use Premonition as part of their hiring process. AL: What about your competition? GK: Thanks to our technological edge, we became the biggest fish in the legal analytics pond within months of securing our initial financing. We have a larger database than the previous market leaders combined (Bloomberg, Thomson Reuters and LexisNexis). We’re now beginning to see startup competitors, but they have a steep hill to climb. The number two analytics company in the UK has a database of 5,000 cases, whereas we’re quickly approaching 150,000 in that market alone. That’s a fraction of 1% of our total global case-flow. AL: What in your opinion has helped Premonition remain agile? GK: We’re growing rapidly, but we’re fortunate that a huge part of what we do is based on the AI and the processing system we’ve already built. That means we experience more system-based growth than team growth. Our system covers most of the growing pains, such as they are. AL: It seems like your model of applying machine learning to big data could have broader applications. Is Premonition expanding its offerings? GK: We certainly are. There are few aspects of modern business that don’t touch on litigation and the law in some respect. There is a vast amount of information to be gleaned from court records if you’re able to think laterally. 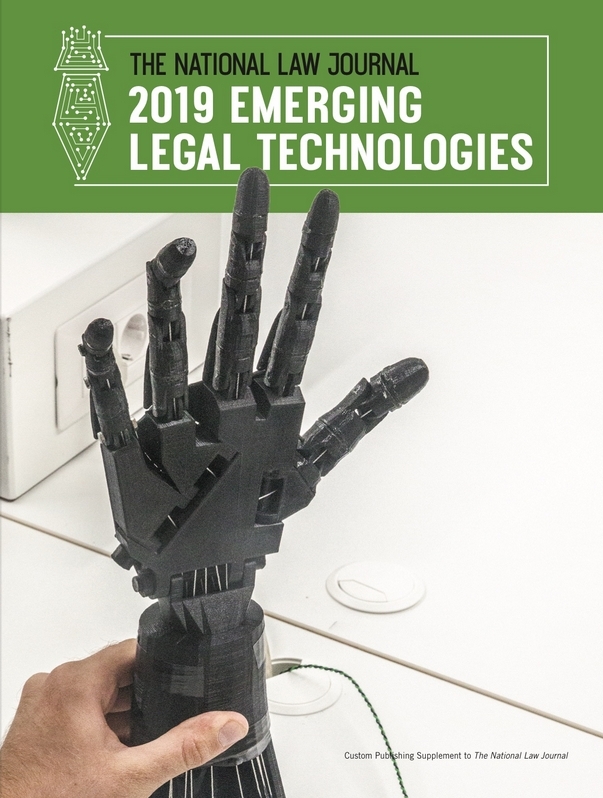 For example, by mapping insurance industry line of business (LOB) classifications to court case types, we were able to produce a new proprietary dataset analysing litigation effect on that industry. Traditionally insurers rely on actuarial models to assess underwriting risk. When reality diverges from these models, things can get very, very expensive for them. For the first time ever, insurers can see types of risk trending in real time – and adjust their pricing and underwriting accordingly. We also took on a project linking litigation and stockmarket data, to determine which industries are most affected by litigation outcomes. We looked at what the typical effects were, and how much lead time investors could expect between a judgement and a measurable impact on stock prices. We’ve even been able to measure the effectiveness of specific lobbyists on getting legislation passed, and that only took us a week to set up. We haven’t done anything with the lobbying industry yet, except to code this up. At present, we’re focused on developing and maximising the value of our proprietary litigation database. But, as we expand, our AI will be applicable to a wide variety of big datasets. Premonition is well-positioned to become an industry leader not just in legal analytics, but in analytics, full stop.